"Taramani" redirects here. For the Indian film, see Taramani (film). 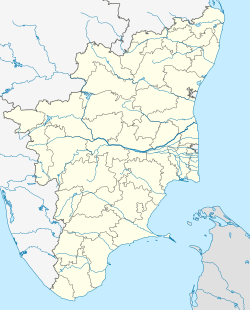 Taramani is an area in the south Indian city of Chennai. It is known for the presence of many IT parks and research institutions. It is located adjacent to the posh residential area of Adyar in South Chennai. It is an Estate with Express IT Companies, making it a massive located neighbourhood in the IT Expressway. The temple of Madhya Kailash, at the junction of the Old Mahabalipuram Road and Sardar Patel Road, marks the beginning of Tharamani. Tharamani adjoins Adyar, Thiruvanmiyur, Velachery and Perungudi. The arterial road, often described as an IT corridor, is Rajiv Gandhi Salai, formerly known as Old Mahabalipuram Road. Another important road in the area is the Tharamani Link Road which connects Tharamani with Velachery. It runs from SRP Tools Junction on Rajiv Gandhi Salai to Vijayanagar bus terminus in Velachery, where it merges with Velachery Main Road, which goes from Little Mount Junction in Saidapet to Tambaram via Medavakkam. This is being widened into a six-lane road because of the enormous increase in traffic. Tidel Park, an first information technology park in the city and South India's first IT park, is situated here. It was constructed in the vacant land near MGR Film City, and space for parking was taken from MGR Film City. The area is now known for its many IT parks including Ascendas IT Park, Ramanujam IT Park, Elnet Software City and TICEL Biotech Park. The World Bank has opened one of its largest offices in Tharamani to house its growing financial and technical support services. The 120,000 square feet (11,000 m2) facility is on a 3.5-acre (14,000 m2) plot near Ascendas. Japanese School Educational Trust of Chennai (チェンナイ補習授業校 Chennai Hoshū Jugyō Kō), a weekend Japanese school, is at American International School Chennai. It moved to AIS Chennai in 2003. There is a bus terminus in Tharamani. 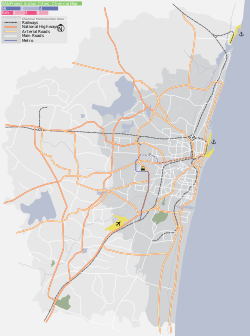 There are also two MRTS in the area, Thiruvanmiyur and Taramani. The MGR Film City was constructed in Tharamani in 1996. The Film City was a major project of Tamil Nadu Chief Minister J. Jayalalitha during her first term in office. Recently, there have been news reports that it is being converted into a "Knowledge Park". ^ "Decks cleared for six-laning of Taramani Link Road". The Hindu. 23 July 2009. Retrieved 14 December 2018. ^ "アジアの補習授業校一覧（平成25年4月15日現在）" (). Ministry of Education, Culture, Sports, Science and Technology. Retrieved on 13 February 2015. "チェンナイ Japanese School Educational Trust of Chennai Inside American International School Chennai, 100 Feet Road, Taramani, Chennai, 600113, INDIA"
^ "ＨＡＮＤＢＯＯＫ（学校案内英字版）." Japanese School Educational Trust of Chennai. Retrieved on 13 February 2015.